Natalie Dormer Photos, News, and Videos | Just Jared Jr.
Charli XCX wears a pretty gown while attending the 2018 Serpentine Gallery Summer Party held at Kensington Gardens on Tuesday (June 19) in London. The 25-year-old singer was joined Anya Taylor-Joy, Kaya Scodelario, Ellie Goulding, Jenna Coleman, Suki Waterhouse, Natalie Dormer, and Max Irons. Also in attendance were Princess Eugenie and Princess Beatrice, Ciara, Ellie Bamber, Mia Goth, Lara Stone, Ella Purnell, Russell Tovey, and Alexa Chung. In case you missed it, check out Charli throwing insults at her pal Tove Lo for a recent episode of Drop The Mic. FYI: All the ladies are wearing Chanel. Ellie B is wearing Jimmy Choo shoes. Jennifer Lawrence Reunites With 'Hunger Games' Cast at BAFTAs 2018! Jennifer Lawrence looked so elegant while stepping out at the 2018 EE British Academy Film Awards! The 27-year-old actress hit the red carpet at the award ceremony on Sunday (February 18) at Royal Albert Hall in London, England. She was joined at the event by her Hunger Games co-stars Sam Claflin and Natalie Dormer. Also in attendance was Jennifer‘s ex-boyfriend Nicholas Hoult. FYI: Jennifer is wearing a Christian Dior gown, Charlotte Olympia shoes and carrying a Roger Vivier bag. Sam wore DKNY. Natalie Dormer strikes a pose in the mud while attending the 2016 Glastonbury Festival in Glastonbury, England on Saturday (June 25). The 34-year-old Hunger Games actress was joined at the annual festival by performer Ellie Goulding and Rita Ora. Looks like Natalie is enjoying the music all weekend long! She was spotted at the festival the day before as well. “En route to Glastonbury!” Ellie tweeted while on her way to the music festival. Ellie is set to hit the stage on Sunday! FYI: Ellie and Natalie are wearing Hunter Original boots. Natalie is carrying a Tory Burch bag. 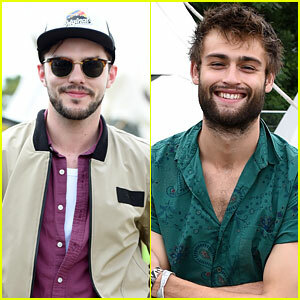 Nicholas Hoult & Douglas Booth Attend Glastonbury Day One! Nicholas Hoult and Douglas Booth stop to snap some pictures while roaming around the grounds at the Glastonbury Festival on Friday (June 24) in London, England. Other stars seen checking out the music scene during the first day of the festival were The Maze Runner‘s Will Poulter and The Hunger Games‘ Natalie Dormer. Nick, Natalie, and Will were all see keeping their feet out of the mud thanks to their Hunter boots. FYI: Nicholas is wearing a Hunter jacket and boots. Douglas is wearing Converse shoes. Natalie is wearing Hunter boots. Will is wearing Hunter boots. Natalie Dormer strikes a pose as she arrives at the 2016 Women In Film Crystal + Lucy Awards Presented by Max Mara and BMW on Wednesday night (June 15) at the Beverly Hilton in Beverly Hills, Calif. The 34-year-old Hunger Games actress was joined by Greer Grammer at the event. On stage, Natalie accepted the Face of the Future award from Max Mara ambassador Nicola Maramotti at the event. FYI: Natalie is wearing Sophia Webster shoes. Rowan Blanchard shows off her studded cape while attending Max Mara‘s Women in Film Face of the Future event at the Chateau Marmont on Tuesday night (June 14) in Los Angeles. The 14-year-old actress was joined at the event by her Girl Meets World co-star Sabrina Carpenter as well as Katherine McNamara, Peyton List, Ashley Tisdale, Connor Franta, Isabella Fuhrman and Kerris Dorsey. Other attendees included Natalie Dormer, Emily Ratajkowski, Kat Graham, Alexandra Shipp, Ireland Baldwin, Selma Blair, Jessica Szohr, Lili Reinhart, Serayah and Lydia Hearst. After the event, Sabrina took to her Instagram to share a chic photo from inside the party. “@maxmara #womeninfilm,” she simply captioned the image. FYI: Ireland and Peyton both carried Edie Parker clutches.